After a series of weekly declines, polished diamond prices have posted a small rebound in the Israeli diamond center, rising by 0.09%, according to Carats.io’s GDX diamond index. 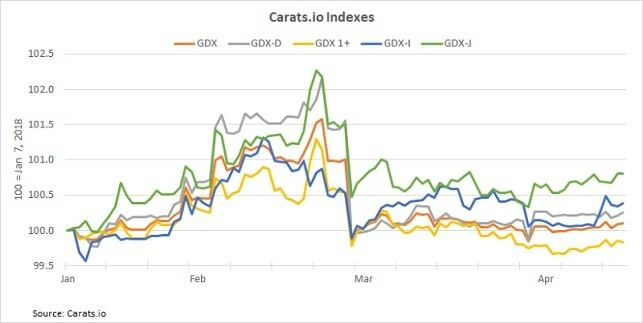 The Carats.io GDX (Get-Diamond Index) is the first diamond market index based on real diamond trading data. GDX is based on the daily diamond trading data within the Israel Diamond Exchange (IDE), using a sophisticated proprietary algorithm to track tens of thousands of GIA-certified round diamonds of individual diamond grades, based on not less than 14 diamond parameters. Wholesale polished diamond prices in Israel increased nearly across the board as local diamond wholesalers performed a series of small price adjustments, including a strong price increase on Wednesday. This is a positive development in the diamond market after prices softened throughout March and were largely flat during the first week of April. The GDX index, Carats.io’s general index, closed the week with a 0.06% increase compared to the prior week. GDX averaged 10,006.49 during the 15th week of the year (April 8-14). The index represents the most tradable diamonds in the Israeli diamond market. The GDX index opened the week at 10,003.56 and closed at 10,009.38. The largest price improvements were among the higher-end goods with higher colors and better clarities, as reflected in the GDX-I index. GDX-I increased 0.2% compared to the prior week. The second highest price increases were for goods of typical interest to the American jewelry industry, represented by the GDX-J index. These goods rose on average by 0.12% compared to the prior week. Prices of the smaller goods were flat.